Crispy skin that crackles as you cut into it. Tender, juicy meat underneath that skin. Is there a more classic dish then a roast chicken? Is there a more useful cooking technique then then roasting? Doesn’t almost everything taste better roasted? The perfect roast chicken is an easy but polished centerpiece to a meal. Or you can take a roast chicken and break it down using every scrap for different recipes and even stock. 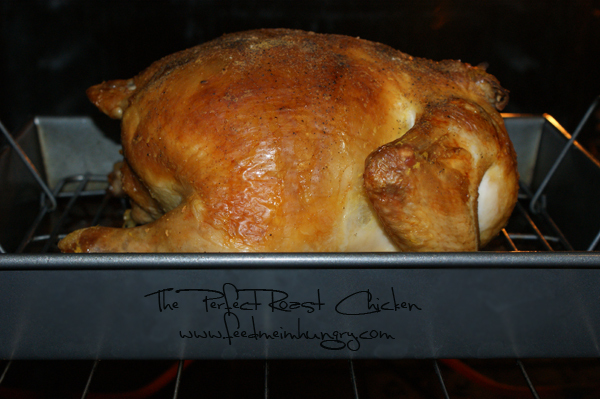 The perfect roast chicken is economical. At my local chain grocery store a whole chicken runs 98c/lb. But chicken thighs go for 2.99/lb. And boneless skinless chicken breasts 3.99/lb. And a can of chicken stock, $3.00! Point being if you are willing to deal with a whole chicken you can knock a few bucks off the grocery bill, or spend it on fancy cheese! Clearly you need to go out and buy some chickens now, right? Now that I’ve convinced you of the wonders of the perfect roast chicken I must make a confession. Until not that long ago I didn’t know how to properly roast a chicken. (Shock! Horror! How can a person without extensive chicken roasting knowledge write a food blog?) I actually figured it out reading this great cooking memoir, Beaten, Seared, Sauced. The directions were so simple you really couldn’t call it a recipe. Yet the next day I tried it and was rewarded with that crispy skin and moist meat. It was promptly devoured by the husband and my oldest son. My oldest has declared I am no longer allowed to cook chicken without skin. This is easy enough that you may want to buy and roast three chickens at once. Eat one for dinner the night you roast and toss the rest in the fridge to turn into all sorts of other things. Save your bones after your done eating (toss them in the freezer in a ziplock) for chicken stock! A recipe for stock will be coming up down the line. 1. Preheat the oven to 400*. Prepare your chicken for roasting, which for a grocery store chicken generally means removing the liver, gizzard, etc. which is tucked inside the cavity. You can also stuff and truss your chicken, or butterfly it. I stick lemons in the cavity all the time but never bother trussing or butterflying. I pull the legs together and bind them with a bit of cooking twine or even foil in a pinch. For more prep help check this out. 2. Place your chicken in a roasting pan on a roasting rack. No rack? No problem. Roll up some foil into ropes and use them to prop up the chicken. Or cuts some veggies nice and thick and prop the chicken up on them. Any method you use, elevate the chicken. This is key! 3. Season your chicken liberally with salt and pepper. This is really the only seasoning you need. Though any seasoning you like will most likely taste great. 4. Toss the chicken uncovered in the oven. Cook for about 30 to 45 minuets at 400* until the skin is starting to look nice and brown. Reduce the heat to 350* for the rest of the cooking time. To check your chicken, from time to time tip your chicken over and allow the juices to drain from the cavity. When the juice no longer runs pink the chicken is done. For me a six pound chicken takes about two and a half hours give or take. Here is a chart for general cook times. I find it helpful to know what to expect for cook time before I get started. If you want to temp your chicken, foodsafety.gov recommends cooking your poultry to 165*.